Open, airy, room to spread out, entertain and grow, and all on one level! This transitional/rustic beauty marries elegance with casual living spaces. The private master suite includes a large dual entry shower, free standing tub and an exercise area. Bedroom 2 is a perfect guest sanctuary. Note the ceiling treatment in the spacious game room as well as the wet bar. A tech center is conveniently located adjacent to the kitchen. The oversized outdoor living area features a cooking space. Four bedrooms, three and a half baths. A perfect blend of traditional and contemporary, an exquisite exterior draws you in. The spacious living room has a stepped ceiling and is separated from the kitchen by an oversized island. A breakfast nook opens to the patio and a separate formal dining room is adjacent to the butler’s pantry/wine grotto. This home is made for entertaining! Note the fireplace by the recessed TV space and audio-visual cabinet. Bedrooms 2 and 3 share a Jack and Jill bath and also included is a generous study. The loft conveniently includes a bath as well as a walk-in closet. The two car garage contains extra storage space and offers a mud room to the interior of the house. The crown jewel of this beautiful home may just be the outdoor living area with the tongue and groove ceiling. 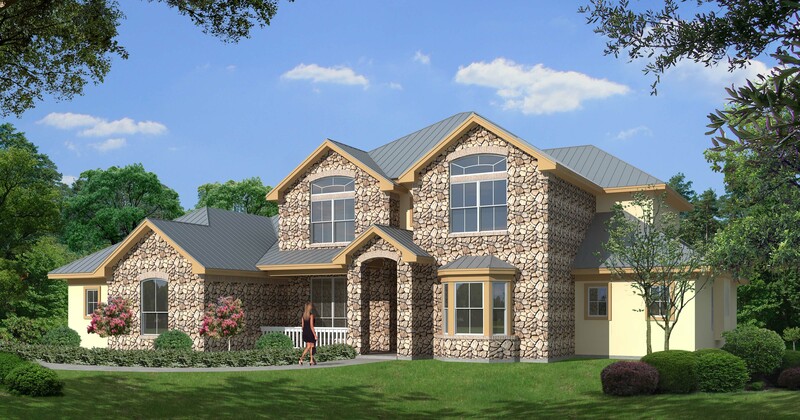 Three bedrooms/study, four baths. "Specializing in product design and development for the volume and semi-custom builder." What separates a good designer from the pack? First and foremost is the ability to listen and translate. Whether designing for the volume or semi-custom builder or for an individual, the key to putting on paper a design that works for the client is understanding their ideas and having the experience and vision to create a quality product. Jim Cox Designs is the one-stop destination for your design needs. This website and all content presented herein is Copyright © 2018 Jim Cox Designs, Inc. All Rights Reserved. Read more information specific to the Copyright of architectural plans and drawings here.